This is my kayak trip log. On a cold Sunday in April we did a whitewater kayak voyage from Barton to Carver on the Clackamas River. Alder Creek was doing one of their Fundementals of Whitewater Kayaking classes and Katlyn and I tagged along as alumni on the river run day of the class (Sunday). It turned out to be a good group. The Alder Creek coaches were Paul, Annette and Shawn. There were five students in the class, and two alumni (Katlyn and I). Can't remember all the students' names. A few were Marin (sp? ), Jo, Kevin, and Chris. All good folks to hang out with. Neither Katlyn or I had been whitewater kayaking since December. She did pretty well. I was definitely feeling rusty. So it was good to get out. I was paddling much better by the end of the day. But at first, not so much. And early on my roll sucked -- I was definitely shocked at how cold the water was so tried to roll before getting setup properly. I (almost) always got it on my second try. But in one rapid I was doing great, then slipped up in some way and I was just over instantly. I again was too hasty in my roll attempt and it didn't work. As I was taking my time getting setup for my second attempt I ended up in fast moving water about six inches deep moving across a shelf of very slick clay. So I was dragged along for awhile before the water got deep again, the result being that one side of my drysuit was caked in clay. Katlyn thought this was hilarious. I'm glad I was able to provide some entertainment value. Then after lunch the sun came baking down. At this point in the trip we were often just in deep water. I took a good bit of time practicing my rolls in various situations, got used to the cold water, and got it back. So yep, practice, a good thing. The water was bigger and much more swirly than when we were out in December. Of the non-instructors, almost everyone went over a number of times. But folks were in general doing pretty well. And when they went over most requested an Eskimo rescue and it worked. Katlyn did well. She was just calm, had this great upright seated position and nice strokes, and loved the rapids. Never once went over unintentionally. Her only problem was that her hands were very cold alot of the day. Understandable. The instructors congratulated her for coming out in the snow in December and the sleet today and promised her that her efforts would be rewarded by great days paddling in the sun in July. 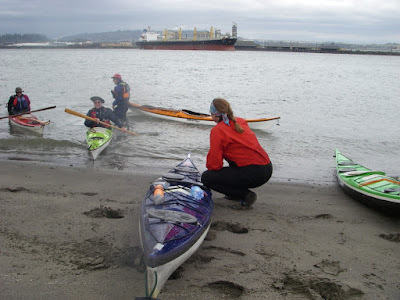 On a pleasant Sunday in mid-April an intrepid band of OOPS paddlers kayaked around Lord and Walker Islands (in the Columbia River near Longview). This was an OOPS trip. Joanne Barta organized the trip and was one of the leaders. Don Beale and Ken Durbin were co-leaders. There were 11 of us total. 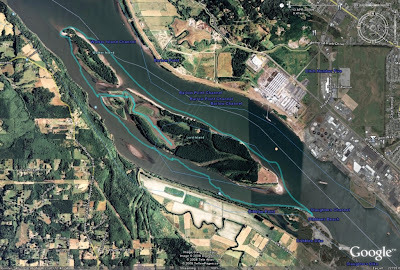 The plan was to meet at Dibblee Beach on the Oregon side of the Columbia River at 9am and be on the water by 10am, paddle downstream in the main channel taking advantage of the current, have lunch at the north end of Walker Island, and return to Dibblee Beach upstream via the slough on the Oregon side. High tide in Longview was at appr 9:40 and the next low tide was at appr 18:40, so we'd be paddling on an ebb the entire trip. The weather prediction was chance of showers, winds W - NW 7 - 10 mph. After everyone got their gear ready and we talked about the plan for the day and safety we got on the water at 10:10. The day started off overcast and cool, with very little wind, but it looked like we could get some showers. We headed out into the main channel of the Columbia and it was easy paddling with the current. 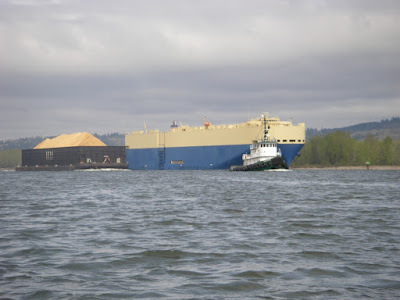 We watched a freighter pass a tug pulling a barge. Looked like a very slow-motion drag race. The day had warmed up a bit by the time we stopped for lunch at the north end of Walker Island. We had a very nice lunch stop. We even had entertainment! Joanne was practicing throwing her harpoon and then giving others who wanted to try it a bit of instruction. After lunch we meandered in the wetlands of Lord Island. Very pleasant paddling. We saw eagles, ospreys, geese and lots of different ducks. We stopped for a bit to stretch our legs and Joanne and Don showed us that you don't need to be near dry land to do that! All in all a very pleasant day paddling and hanging out with a good group of folks. On a chilly Tuesday in early April, Ken and I paddled from Boston Harbor to Devils Head and back. I hadn't been paddling in the South Sound in some years and Ken had been wanting to take me out kayaking there and show me his neighborhood. Ken lives in Olympia and so knows many of the little nooks and crannies of the many and various arms of the southern part of Puget Sound. 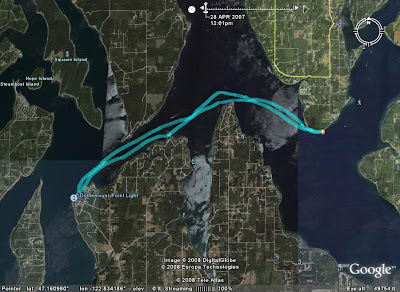 I'd read about many of these areas for paddling in Washburne's book "Kayak trips in Puget Sound and the San Juan Islands", but had only paddled once in the Nisqually Delta. And that was some years ago. 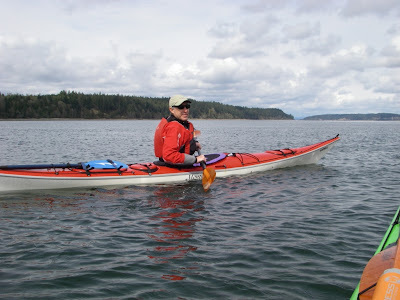 Given the tides and the time we had, Ken chose a trip starting from Boston Harbor, just north of Olympia, to Devils Head and back. The plan was: The tide was ebbing so the current would help us going east to Devils Head. We would have lunch at Devils Head. Slack was at appr 14:15. We would return to Boston Harbor with the help of the flood current. Sounded good to me! We got on the water at appr 12:30. It was cool, with just a bit of a breeze from the south. As we went through Dana Passage we could really feel the ebb current. Ken told me that on the flood if there's a west wind opposing it you can get some steep waves there. We got hungry well before Devils Head so stopped at Dickenson Point for lunch. Lots of mussels and sea anemonies on the rocks. Lots of goeduck clams sticking there necks out in the shallow nearly-low-tide water. It was cool but sunny at lunchtime. We got back on the water and headed east toward Devils Head. Got a bit of a south wind as we crossed the mouth of Henderson Inlet and a bit of wind waves. The wind subsided as we approached Devils Head and we had a lovely paddle in that area. Stopped for a rest on the beach. Then as we saw dark clouds to our south and east we decided to head back. The flood current was definitely helping us. But then we got into a small squall with a bit of rain and appr 12 kt west wind in Dana Passage. And yes, we got those steep waves. Not too big -- appr 1.5 ft. But it was work paddling against the wind. But as Ken noted, paddling against the wind gives you a good opportunity to work on your forward stroke. Since your forward progress is slowed way down you can focus on each aspect of the stroke, like, well, in slow-motion. But then the wind subsided, we still had a nice flood current, and we were cruising along at over 6 kt! We got a bit of tidal race action in Dana Passage which was lots of fun. Then we turned south to get back to Boston Harbor and all was calm again. A very nice day on the water. 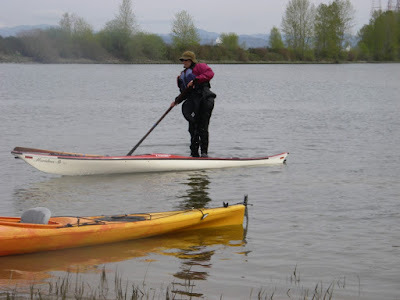 On a mild Saturday in late March, Kristin and I explored the Scappoose Bay waters. Our goal was to get out and do some mellow wetland paddling. Due to time constraints we also needed somewhere relatively close to town so we chose Scappose Bay. We put in at the Scappose Bay Marina about two hours before low tide. 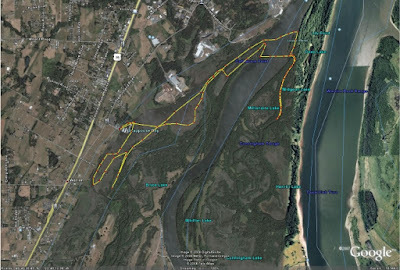 Since the water was ebbing, we first paddled out of Scappoose Bay, across Multnomah Channel, and up the little river flowing out of Sauvie Island across from Scappoose Bay. 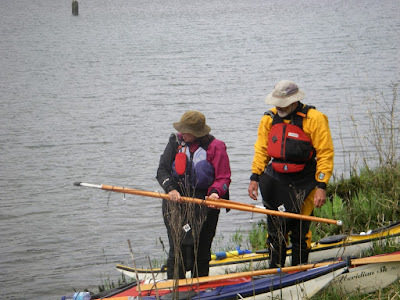 Then, as the tide was beginning to flood, we paddled back in to Scappoose Bay to explore its wetlands as they filled with water. Well, they weren't filling up very fast so we found ourselves paddling in about 12 inches of water alot of the time. We were thus thankful we were paddling kayaks. It was a beautiful spring wetland paddle where we saw alot of birdlife: geese, including some beautiful white ones, ducks, herons, etc. And we startled alot of carp in the shallow water. Hello. This blog is my kayak trip log. It gives me a way to let friends who don't live in the Pacific NW a bit about the kayaking trips I go on as well as just reminding me of what I've been up to.